I've come over to the site from time to time to read and poach some technical info. 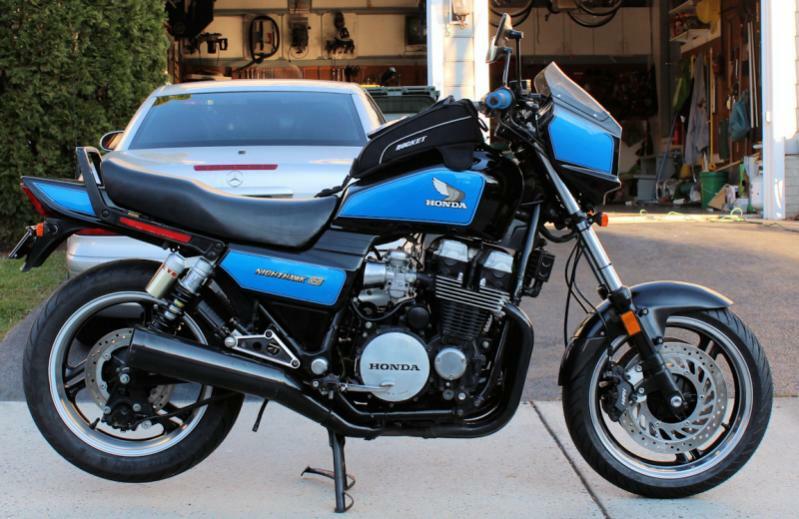 I don't have a Superhawk, but have a distant relative from the Honda family tree; 1984 CB700SC Nighthawk. I am posting on this site since I used some VTR components to create the retro Nighthawk. I have been working to bring it into the 21st century by upgrading the tires, suspension, and braking. For my riding envelope, it has enough peak HP for now. I have largely finished the wheel swap, tire upgrade suspension changes, and brake swaps. Once I get the swingarm back in (today? ), the bike will be rideable again. 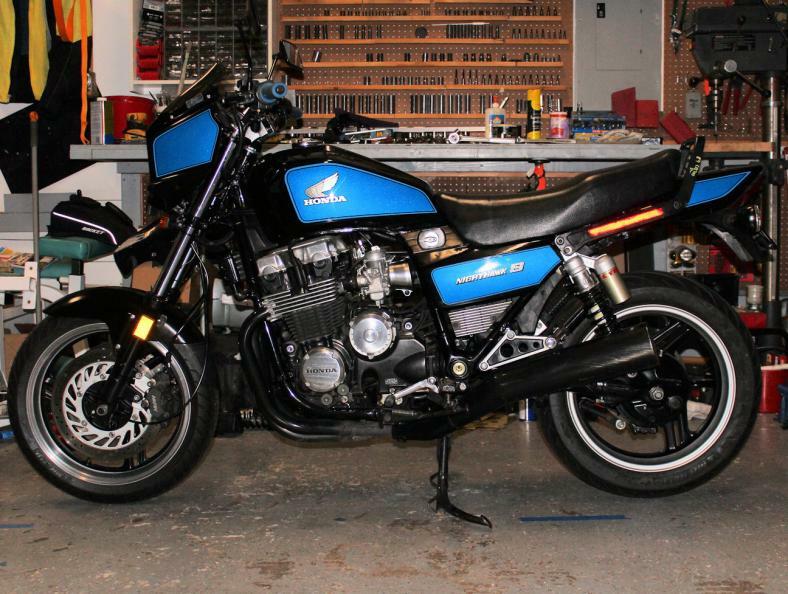 I have the chin spoiler and factory (CBX) bags to integrate in before taking on a cosmetic redo next winter. I will leave her cosmetically a bit rough this riding season so I can ride her this coming season. Front brakes: VTR dual 4 pot fixed calipers with offsets to accommodate 316mm ST1100 PanAmerican discs. 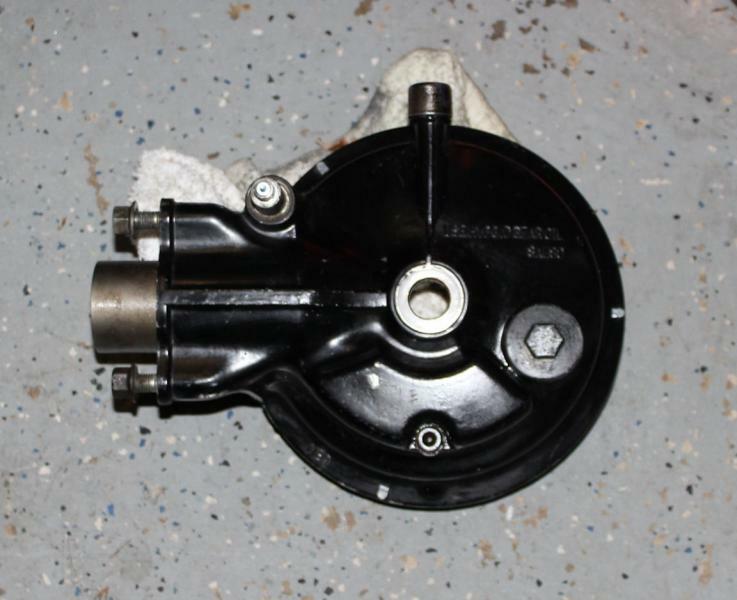 Rear brake: 2001 Triumph Trophy 1200 rear caliper and axle bracket squeezing a Honda blackbird 256mm disc. There are lots of other bits and bobs from a lot of other bikes, but they generally go together to look factory. Damn, that's a clean bike. Looks factory. Nice work this is actually very well build bike to begin with, for the era! In fact better then the later 90's models which Honda tried to cut on costs and make it as basic as possible. 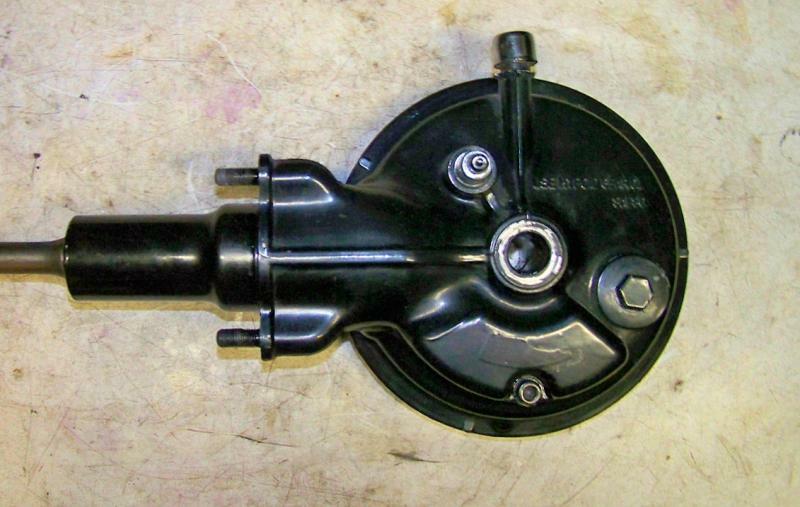 Hydraulic valves makes the motor bullet proof and lots of torque at low end for. 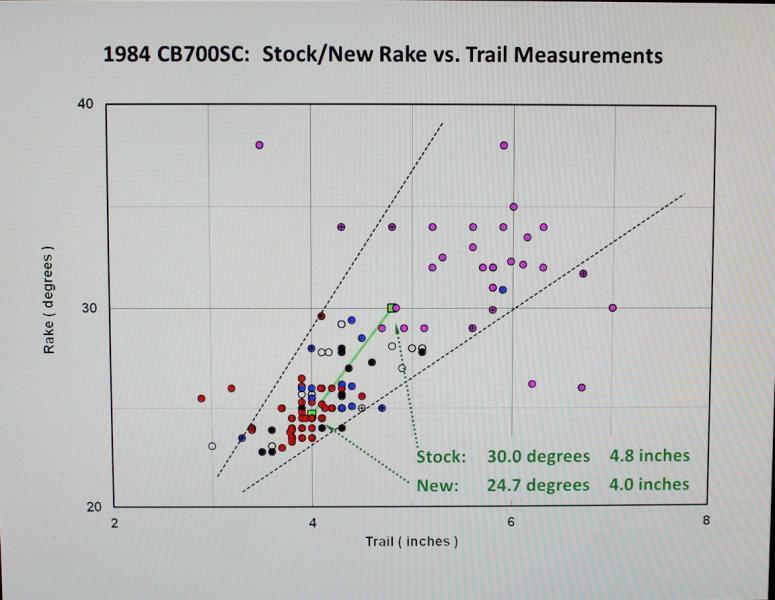 Did you consider going to fixed calipers? Nice bike, much edgier than the original. Front wheel is CBR600 F2 had to keep the speedo' cable. These calipers working better then I expected, if you remeber, this model came with single rotor in the front, this setup bites hard. 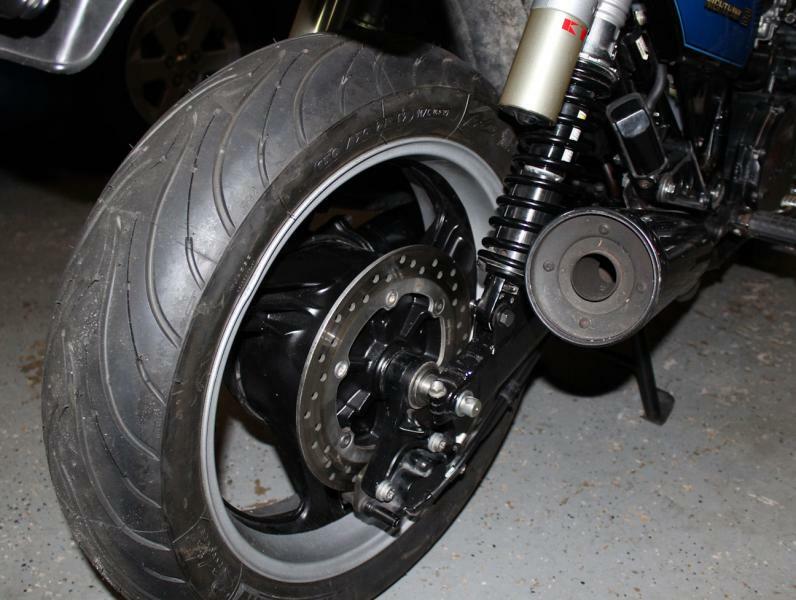 The '84 through '86 CB700SC came with dual discs in front and drum in rear (shaft drive). With the stock 16" wheels, it was easy to lock up the front brakes. The front rotors in spacetiger's photo are way larger than stock. This is actually the first generation NightHawk! It's an aircooled chain drive 650 or 750 circa 81/82. They were usually Cobalt Blue with a Chrome Graphic on the tank. Only built for 2 or 3 years. The 84 thru 86 were completely different motors and as already noted had hydraulic vavles and shaft drive. Good bikes I had a red and black one, learned to hate 16 inch front wheels! Are you referring to spacetiger Bike? I thought it is the same motor as the later 700S... Honda already had the Hydraulic valves in 84 in the 650NH, at list to my memory. Last edited by NHSH; 01-06-2013 at 04:35 PM. Got the shock lower mounting points moved forward about 2 inches using an 87 VT700 Final drive and modified the right side using part of a PC800 swing arm. New 24.7 degrees and 4.0 inches. I'll take it out sometime this week if I can get home early with daylight. Looks like it's well balanced mate, should be easier to lean into turns with this setup. Spacetiger,I had 3 buddies with Nighthawk 750's(in Canada)They were tough bikes those guys ran them hard!One of the guys had big carbs and a supertrapp it sounded great and if I'm not mistaken he machined (thinned)a second spring for the clutch,to stop it from slipping.Thanks for the flash back !you're doin that bike proud!! !